As we approach Holy Week, we might think about the Pharisees, busily plotting how they would stop Jesus. We shake our heads and ask ourselves, how could they be so evil? These men were pillars of the community – they worshipped at the temple (THE Temple), faithfully studied scriptures and followed the Law to the letter. If they were around today, we’d consider them good Bible reading, churchgoing men. The law given to Moses prescribed many aspects of everyday life, and these men were law abiding citizens. In terms of that time in history they were the good guys. On the other hand, this Jesus was, in their eyes, and in the eyes of the Law, quite the sinner. Imagine how we’d react to someone who had no visible means of support. Someone who wandered around the countryside, crashing on the couch of anyone who’d have him. A guy who hung around with hookers, street people (and diseased street people at that) and other seedy types. That’s exactly how the Pharisees reacted. 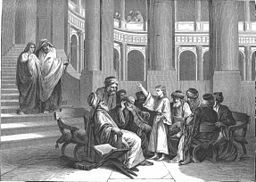 Is it possible that without Faith we’d be just like the Pharisees? This entry was posted in Culture, Education, Family, Friends, History, Media, People, Philosophy, Politics, Religion and tagged Bible Study, Christianity, God, Holy Week, Jesus, Moses, Pharisee, Temple. Bookmark the permalink. Yes. When you put it that way, I could possibly be one of those people pointing and shouting crucify him! Thank God for The Faith that had led me to believe in Jesus.